Mark Zuckerberg took the stage and announced a new headset: the Oculus Quest. It will be a standalone 6DOF VR headset with dual motion controllers, and will be able to run the some of the same software from the Rift, such as Robo Recall. It will be $399, available in Spring 2019! Wow gonna get this definitely….! Oculus Quest uses Oculus Insight, which enables inside out tracking at 1 khz to determine the 3D space around you, without external sensors. Oculus even built a 4000 square foot arena to demo this technology. Multi-room Guardian: you can take your Quest to different rooms and it will remember the Guardian settings for that particular room. Oculus Quest use a thumbstick but works with all Rift games. 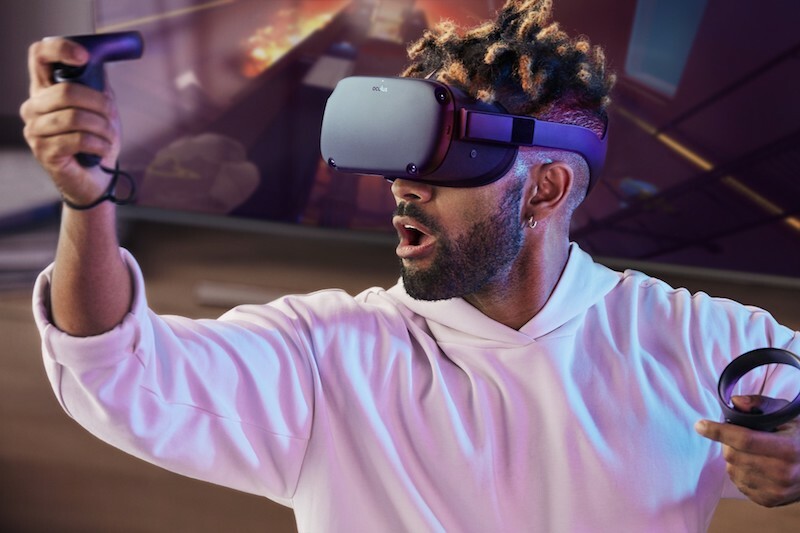 Oculus Quest uses a sound system like Oculus Go (with invisible speakers), but with deeper bass. It will have the same optics as Oculus Go, except that the distances between lenses can be adjusted. Oculus Quest will have 50 high quality games at launch, including Vader Immortal, a VR game set in the Star Wars universe. Rift games will be easy to port into Quest. Oculus announced a concept for a virtual workspace. Their plan is to will enable face to face communication in virtual reality. Besides bringing people together for social purposes, Oculus is also proposing to use it for a virtual environment, taking telecommuting to the next level. OrbusVR, a VR MMORPG will have a major update next year. Vox Machinae, a VR mech game is launching today. Looks awesome. Space Junkies, a shooter from Ubisoft. Stormland by Insomniac coming in 2019. The Oculus home screen can now be completely customized with your own virtual furniture and items, including items that can be from your favorite games. Oculus Avatars can now be used in other platforms, including Steam. Expressive Avatars look more natural. A new Oculus Rift mobile app can now be used to remotely manage your games for the Rift (downloading etc.). Hybrid apps: developers will be able to convert desktop apps into first class VR experiences. A single app can run either in 2D or in VR. As an example, they showed how this makes 3D modeling much easier. Curious how this could be used for 360 video editing. YouTube FINALLY coming to Oculus Go! Casting – you’ll be able to cast from Oculus Go to smartphones or your TV, so your friends can watch what you’re experiencing. NBA games coming to Oculus Venues. If you watch an NBA game on Venues, you’ll get a free NBA jersey for your avatar. Michael Abrash, Oculus’ chief scientist, made predictions for the future of VR. I loved the keynote. Very excited for Quest! I know some people wanted CV2 but maybe they will tease that tomorrow. Quest seems like a more logical step right now to me. yes me too! on paper, it does sound like it checks all the boxes! Love the improvements, especially for the Go! Yes a lot of great news!